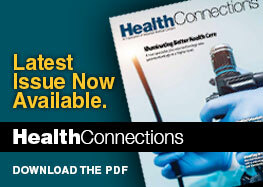 Comprehensive medical services and compassionate care close to home. As a publicly owned, not-for-profit hospital system, Marshall Medical Centers provides comprehensive inpatient and outpatient healthcare services. We serve the residents of Marshall County and the surrounding area (population about 125,000). With two hospitals, nine outpatient locations, and a highly trained team of physicians practicing 25 specialties, Marshall Medical is a confident, convenient choice for local healthcare. Residents can remain close to home and receive excellent care – often provided by those who are neighbors and friends. Named by the Joint Commission as a "Top Quality Performer" among America's hospitals, our patients can be assured they are being treated in an environment where a premium is placed on quality and best practices. Marshall Medical — many reasons, one choice. You may be eligible for financial assistance under the terms and conditions the hospital offers to qualified patients. For additional information, contact the hospital financial assistance representative at 256-894-6600. 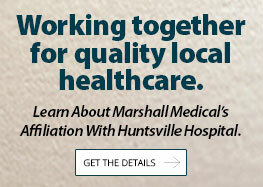 Marshall Health System is committed to providing services that meet the expectations of those we serve. Concerns related to care or service may be directed to the Administrative office at Marshall Medical Center North at 256-571-8008 or Marshall Medical Center South at 256-840-3683. If the concern remains unresolved, The Joint Commission can be contacted at 1-800-994-6610 or the Alabama Department of Public Health can be contacted at 1-800-356-9596. Concerns or questions related to financial issues or billing may be directed to our Financial Center at 256-894-6600. Biographical information on our CEO and Administrators for Marshall North and South. View our latest TV commercials and download PDF versions of our services brochures.